The Casper Server Edition Trial allows you to try Casper Server Edition risk-free for 30-days. 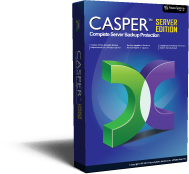 Future Systems Solutions provides a free 30-day trial of Casper Server Edition. You can freely download and install the trial version on your computer for evaluation. This allows you to try Casper Server Edition without any cost or obligation for a period of 30-days. When the trial period ends, the Casper Server Edition Trial will cease to fully function. To continue using Casper after the trial period has ended, you must purchase a license for Casper Server Edition and then download and install the full working version. Casper Server Edition may be purchased online from the Future Systems Solutions Web Store. The Casper Server Edition Trial is designed for both 32-bit and 64-bit versions of Windows and may be fully uninstalled at any time. While fully operational for 30-days, the Casper Server Edition Trial does not provide support for volume resizing. For example, using Casper Server Edition Trial to copy a 10GB hard disk drive to a new 100GB hard disk will result in a 10GB copy being created on the 100GB hard disk; the additional 90GB of space on the new hard disk will remain unpartitioned space. This is strictly a limitation of the trial edition. To create a copy of the 10GB hard disk drive that has been resized to make the additional 90GB of space on the new hard disk available for new files, folders, and programs, you must purchase and use the unrestricted version of Casper Server Edition. Casper Server Edition may be purchased online from the Future Systems Solutions Web Store.